Where did our jaws come from? The question is more complicated than it seems, because not all jaws are the same. 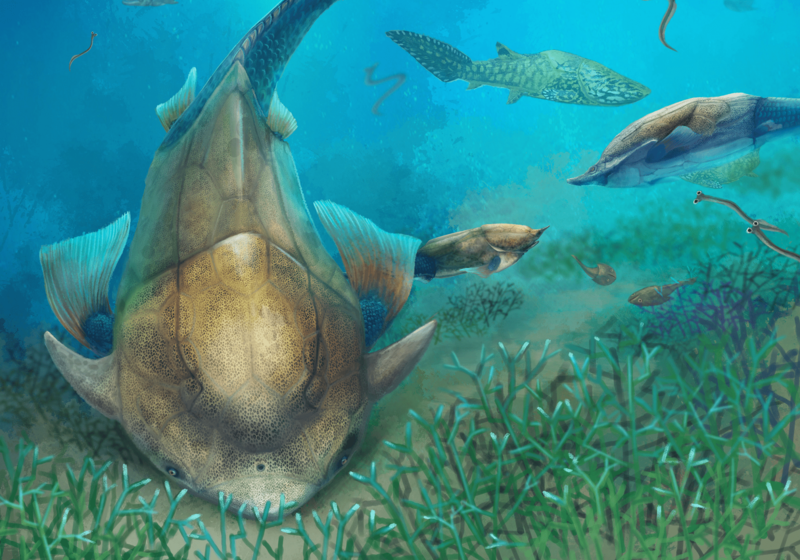 In a new article, published in Science, palaeontologists from China and Sweden trace our jaws back to the extinct placoderms, armoured prehistoric fish that lived over 400 million years ago. Jaws are an iconic and defining feature, not only of our own anatomy but of all jawed vertebrates: not for nothing did Steven Spielberg use “Jaws” as the one-word title of his immortal shark epic. Jaws first appear in the developing embryo as a cartilage bar similar to a gill arch. In a shark, this develops directly into the adult jaws, but in an embryo of a bony fish or a human being new bones appear on the outside of the cartilage. In our own skull, these bones – the dentary, maxilla and premaxilla – make up the entire jaws and carry our teeth. It is universally accepted that the dentary, maxilla and premaxilla are a shared heritage of bony fishes and tetrapods: you will find these same bones in a crocodile or a cod. But what about further back? Only one other group of fishes, the extinct placoderms, have a similar set of jaw bones. But these bones, known as ‘gnathal plates’ and shown to spectacular effect in the giant placoderm Dunkleosteus where they are developed into blades like sheet-metal cutters, have always been regarded as unrelated to the dentary, maxilla and premaxilla. For one thing they are located slightly further inside the mouth, and in any case the general opinion has been that placoderms and bony fishes are only very distantly related. The picture began to change fundamentally in 2013 with the description of Entelognathus, a Silurian (423 million year old) fossil fish from Yunnan in China which combines a classic placoderm skeleton with presence of a dentary, maxilla and premaxilla. Together with the discovery of placoderm-like characteristics in some of the earliest bony fishes, this began to build a strong case for a close relationship between placoderms and bony fishes, accompanied by a substantial carry-over of placoderm characteristics into bony fishes (and hence ultimately to us). But what about those jaws, where did they come from? This is where the new fossil, Qilinyu, comes in. Qilinyu, described this week in Science by palaeontologists from the Institute of Vertebrate Paleontology and Paleoanthropology (IVPP) in Beijing and Uppsala University in Sweden, comes from the same place and time period as Entelognathus, and also combines a placoderm skeleton with dentary, maxilla and premaxilla, though the two fishes otherwise look quite different and must have had different lifestyles. Looking at the jaw bones of Entelognathus and Qilinyu we can see that they, in both fishes, combine characters of the bony fish jaw bones (they contribute to the outer surface of the face and lower jaw) and placoderm gnathal plates (they have broad biting surfaces inside the mouth). Another thing becomes apparent as well: it has been argued that placoderm gnathal plates represent an inner jaw arcade, similar in position to the ‘coronoid bones’ of bony fishes, and if that were true we would expect to find gnathal plates just inside of the dentary, maxilla and premaxilla of Entelognathus and Qilinyu; but there is nothing there. The simplest interpretation of the observed pattern is that our own jaw bones are the old gnathal plates of placoderms, lightly remodelled. It seems like substantial parts of our anatomy can be traced back, not only to the earliest bony fishes, but beyond them to the strange ungainly armoured placoderms of the Silurian period.